Michael's images are featured on the Adobe Photoshop Lightroom website in the top tutorial (as in the image below) and they are also featured in the User Manual that comes with the software. These images wee shot on assignment for Adobe last April - see blog post below. To see the Lightroom instructional video with Michael's images visit http://www.adobe.com/products/photoshoplightroom/. Michael was asked to become a contributor for O'Reilly Digital Media's new website Inside Lightroom. As a contributor, Michael will write and publish blog posts every Monday and he will also be writing extensive articles from time to time. 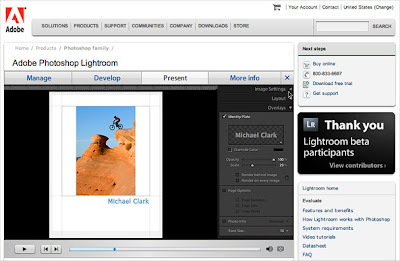 Inside Lightroom is one of the top five Adobe Photoshop Lightroom websites and is sponsored by Adobe. The website will feature a huge amount of information and resources regarding using Adobe Lightroom as well as working with digital imaging in general. You can visit the Inside Lightroom website at http://digitalmedia.oreilly.com/lightroom/. Since 1978, O'Reilly has been a chronicler and catalyst of leading-edge development, homing in on the technology trends that really matter and spurring their adoption by amplifying "faint signals" from the alpha geeks who are creating the future. An active participant in the technology community, the company has a long history of advocacy, meme-making, and evangelism. Long the information source of choice for technologists, the company now also delivers the knowledge of expert early adopters to everyday computer users. Whether it's delivered in print, online, or in person, everything O'Reilly produces reflects the company's unshakeable belief in the power of information to spur innovation.